Lutron Electronics today announced a new addition to its Caseta smart lighting system, this one focused on making most ceiling fans into "smart" ceiling fans with a new fan speed control switch. Lutron doesn't specifically mention HomeKit compatibility for the new fan controls, but the existing Caseta system does support HomeKit through a smart bridge. Like it did for regular bulbs, the Caseta by Lutron fan speed control system connects to a user's existing ceiling fan to allow them to wirelessly control the fan from their smartphone, or the physical switch. 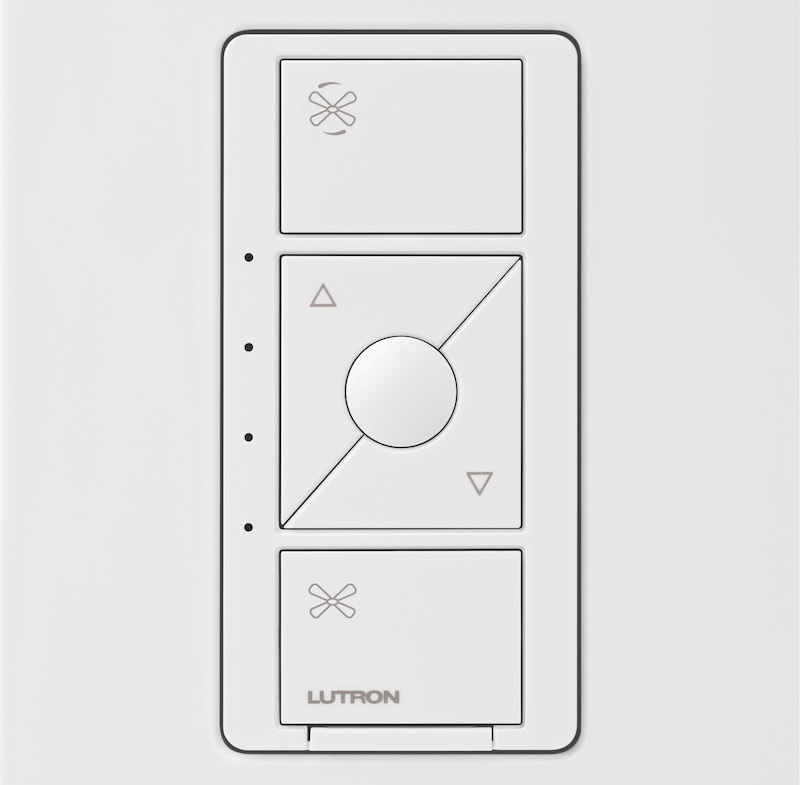 The fan control doesn't require a canopy module and can be easily added to the Lutron app. The company says the installation process is as fast as 15 minutes, resulting in four fan speeds and the ability to set a favorite speed setting. Users can call up Amazon Alexa or Google Assistant to control the fan via their voice, or purchase the added Pico Remote for $42 for manual controls. The Caseta by Lutron fan speed control system will be available in March for $80. The control will be available in white, ivory, light almond, and black, and is compatible with a single 1.5A ceiling fan, and users will need a neutral wire for installation. This is something Caseta users have been demanding for a long time. Good to see it finally. Too late for me, as I just use the simple on/off Caseta switch for our fan, as another user mentioned. The fans in my home were wired with separate switches for the light kit, so I just use a Caseta dimmer switch for those. This ends up giving me on/off control of the fan and dimmable control of the lights. I expect that we would just pair this together with their light control in a double-gang box. That's what I do currently, but for folks whose homes weren't pre-wired for separate fan/light switches, that won't be nearly as easy. Damn, Neutral wire is a killer for me. Not sure why but my 10 year old home doesn't have Neutral wires on the lights/fan switches. Also, these require a hub. Which is a big plus in my book. Any device that you tend to install in bulk are generally better with a hub for many reasons. * Easier HomeKit pairing. Hub is the only device you need to pair. Once you activate other devices on the hub, they will show up automatically on the Home app. * Tends to be more reliable. Lutron Caseta uses Lutron's Clear Connect licensed spectrum (418 and 434 MHz) that is far less prone to interference from other wireless devices. * Wi-Fi tends to degrade significantly (increased latency) when you have more than 2 dozens devices are connected to a network. I do wish Lutron revises the design for these switches. In particular, push buttons are not particularly well suited for fine tuning brightness and fan speed. Touch control is far more intuitive. I would still want physical buttons for on and off, of course. And please Lutron, not requiring neutral wires is a huge selling point. So extend and standardize on non-neutral switches whenever possible. Hubs are indeed the way to go on certain things. Like I want to have to pair one or two dozen bulbs and/or switches to HomeKit. And have fun doing it all over again if you ever have to nuke your HomeKit setup. Lutron’s stuff if unbelievably reliable. My Lutron switches I think are the only things I’ve never seen say ‘unavailable’ in HomeKit. Rock freaking solid. This is great. Going to be buying a house soon and kinda dreaded looking at pricing for HomeKit ceiling fans. Just being able to get any fan I want plus this switch will be great.